God bless H&M's new spring maternity. I may end up wearing these denim-look leggings ($24.90) pretty much every day. Not bad comfort-wise, and has the big belly panel which doesn't get itchy till 3pm-ish. Yes, once I lived in horror of the big belly panel, but it has quickly become my best friend. 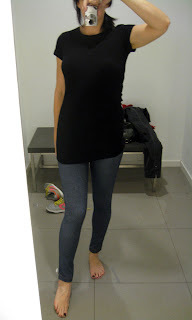 The black top, also, is an important basic ($12.90). I will not be "rocking" any cropped maternity tops, I want all of mine to be Major Coverage. My problem is, how much maternity do you all want to see? Just enough to know where to go when your girlfriend or sister is all knockered up, right? I will still post myself occasionally as ever since I woke up to find that nothing in my closet fits, except for my husband's jeans and my black Daffy's miracle jeans (which are now known as the real-life "sisterhood of the traveling pants"), I'm a little obsessed with maternity clothes. 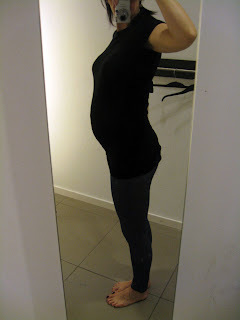 Inexpensive maternity clothes. And strollers. Ack! Now instead of looking at other girls' cute shoes, I'm checking out their strollers. Me, when I caught myself mid-stroller envy, & after I looked in the mirror and saw something huge looking back. So I'll be taking full advantage of volunteer co-worker models. Thanks, guys! And if any of you want to go shopping on 34th Street, or want to post a photo of something you bought on 34th Street, contact me at fashionherald@gmail.com. I can't promise much in return yet, but will happily supply coffee and lots of peanut butter sandwich cookies from 'wichcraft. Eeee! I missed the announcement - CONGRATS, BEAUTIFUL!!!!!!!! Thanks, Sal, you're so sweet! And you didn't miss it, this is the announcement! So congrats, congrats, how wonderful for you! You look beautiful can't wait to watch the belly grow! Thanks for the congrats from all. And Natanya, i thought it was funny you totally caught on, sly! I will def saunter over to 34th for regular picture mail to you - I ask that you forward free lashes and fake nails next time you get a box - you know - that sort of thing lol. you look fabulous FH. i'm all about seeing more of YOU...and more and more...mommy. I am SO EXCITED! It's actually pathetic of me! I feel like an expectant grandmother! i knewwwwwwwwww it! congrats! you know what this calls for? BABY CLOTHES POSTS! eeps - have you seen the H&M baby stuff at Herald Square? ridiculous cute! EM - Now that they've got their spring in, it is perfect! A few things more in line w/regular H&M lines. Sister - Only if you'd had me when you were 13! and stop making me cry, godammit. andtheend - thanks! although a little less fabulous every day, but that's OK.
Miss Yaya - nails and lashes, coming your way monday! I'll LOVE to post your pictures!! i just thought of a way to see more of you without seeing more.. of.. you. makeup posts! would sephora let you do stuff in their HS store? i'm always on the hunt for 1. a good matte red lipstick, 2. something practical and nonorange for this summer obsession we have with coral. plus, i love seeing makeover befores and afters. Congratulations!!!! And Happy Mother's Day! BTW, I won't get tired of maternity pics at all. You are tall and gorgeous and will look like a maternity model anyway. Girl, bring on the pics! Even though I'm all done being knockered up, I still love looking at the cute maternity clothes. La Belette - Thank you!! Imelda - Waive your commission? How sweet, you're all choking me up! eeps - leave it to you to have more great ideas, thanks, that's perfect. I always forget about beauty b/c i never change my makeup! Lipstick - I'll keep posting those maternity clothes just for you! although so far, Liz Lange clearance at Target has been my savior. if only there was a Target on 34th Street - I might die more than if we got a Topshop! Oh Miss Herald, between your post and the comments, we're a big gelatinous, weepy mass of cellular material. Sniff. You look so darn cute it is almost sinful. Really. Oh wow, congratulations! What wonderful news! Keep us updated on how things are ok?